First aired: Summer 2014, 12 episodes. A second season has aired, Tokyo Ghoul √A, but this is a review of season one. Summary: Tokyo is a seemingly normal city, except it is infested by human-like ghouls that survive off of consuming human flesh. Besides that little snafu, ghouls and humans can hardly be told apart, unless the ghoul becomes irate and physical changes occur in their body. As humans tend to be scared of what is different, and of what eats them, a special task force (the CCG) has been put in place to eliminate the ghoul population. One day, a seemingly-normal college student named Kaneki encounters Rize, a girl who is an enthusiastic reader like him, at the coffee shop he regularly frequents. The rest of his life is about to change based on this chance encounter. 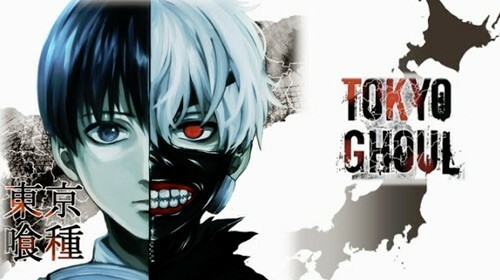 Tokyo Ghoul will capture your attention with the captivating storyline in episode one, and will leave you interested throughout the series with its mixture of action, horror, and psychological concepts. The series will then end by leaving you thinking about the world of ghouls and humans, and who the monster really is. Are ghouls in the wrong for simply wanting to survive? Are humans right to exterminate the ghouls because the ghouls are killing people? There are so many questions you will be asking yourself as you watch this series. An interesting aspect of the series was the use of weapons in the form of “Kagune”. Each ghoul possesses a Kagune that is unique to them, so each one is different. Kagune come from the ghoul’s body and can be many forms, from a blade to claws to wings and many more. Ghouls use their Kagune to attack humans, as well as other ghouls. On top of all that, humans have found a way to harness the power of a ghoul’s Kagune and are able to turn the Kagune into a weapon for the human’s use. This somewhat levels the playing field between ghouls and humans. It is nice to see the humans stand a chance against the ghouls and not just get wiped out. If you have seen D.Grayman or Akame ga Kill, the weapon concept is similar. The characters are memorable, with development throughout the season. The animation is well-done. The story progresses at a decent pace with a proper mixture of action and dialogue. The violence is heavy, but in the version I watched, it is censored by covering the most grotesque animation with black, which is not unique to Tokyo Ghoul, it seems to be the most common way to censor violence in anime. For me personally, this was one of the few negatives I would mention about the series, if you are going to censor the anime, do not make it so obvious, especially when all the gruesome sounds are still present. In conclusion, there is a censored and an uncensored version, so if you do not handle violence well, there is a friendlier version for you. You might enjoy this if: You can handle a brain-twisting anime that will touch on your buttons of psychological fear. 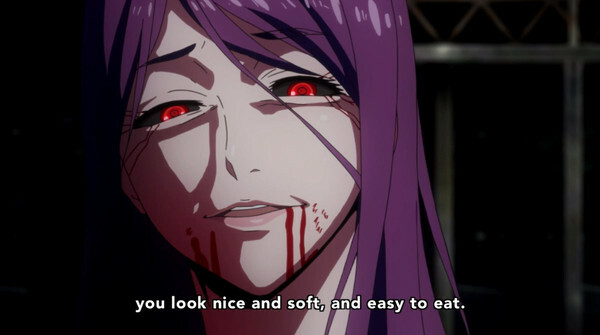 If you enjoyed Deadman Wonderland, you will likely enjoy Tokyo Ghoul. You might not like it if: You are sensitive to violence, gore, and the horror genre. Certain scenes of Tokyo Ghoul are some of the most grisly out there. Note to the Viewer: Be prepared for an action-packed thrill ride that will have you captivated from the first episode! This entry was posted in Anime and tagged 1, 2014, action, anime, drama, first, fragglepuss, ghoul, horror, human, kaneki, mystery, psychological, review, season, summer, supernatural, tokyo. Bookmark the permalink. The movie slides into a kind of bizarre hyperreality that makes its desperation slightly hallucinatory but, paradoxically, more moving. Though far from flawless, it’s an adventurous work that is both disturbing and ultimately moving.